I really want to say that I love being a part of the Wrap Up! Project, and want to share how we’ve grown over the past three years. We’ve done two scarf-bombings this year and already have put out almost as much as we had total the first two years. That’s awesome. Happy New Year from the Wrap Up! Project! To start the new year off, we want to share some awesome statistics with you to show you how the project has grow, well, exploded, over the past three years. We couldn’t have done it without your participation and support! Ok, let’s see and take a look how we’ve grown! During the first season of WUP, we had four scarf-bombings, and 524 items were put out in various places around Lancaster City. Not bad for our first season! For the second season of WUP, there were are total of five scarf-bombings, which included both Lancaster City and Columbia. Ready for this number? 1132 items total were put out for people to take during the cold weather months. Now, keep in mind, we are currently in the third season, but here’s what has been done so far. The Wrap Up, Lancaster Project (WUL) needs some help. We need handmade scarves, extra hands at the scarf-bombing themselves, and funds to bring it all together. That’s why I need to bring your attention to WUL’s GoFundMe page. Right now, money would be a boon. You know all those tags we put on each item that tells the finder that it’s free? Those cost about $200.00 a season to make. A little extra money in the GoFundMe account would be a fantastic way to cover this expense, and would be an excellent way to help out if you love the idea of what we do and want to help out. Monetary donations are a great way to help if you don’t know how to knit or crochet, too. Anything you could give would be appreciated: your abilities, your time, and your monetary support. The Wrap Up, Lancaster Project finished Season 2 on April 8, 2016 with scarf bombings in both Reservoir Park in Lancaster, PA and at the Columbia Presbyterian Church in Columbia, PA. We had a great year!!! Angelia Reed, our fearless and enterprising leader, and I, along her mother and daughter, scarf bombed those places. Angelia broadcasted both bombings on Periscope as I filmed it. We love it if you watch them on Katch here below. Erin Negley of LNP has a been a great cheerleader for the project, too. She is a staff writer for our local newspaper, and wrote an awesome article detailing the second season. I encourage you to read it, watch the videos, and there’s even a great pie chart of statistics. Until next fall, come visit us the East Side Market in Musser Park in Lancaster, PA, starting Sunday, May 17, 2016. Oh, and this is really important……there’s a store open for fundraising for the project. Like t-shirts and/or tote bags? We’ve got you covered. So, here’s to looking forward to Season 3! Last Scarf Bombing of the Season! It’s time for the last scarf bombing of the season with The Wrap Up, Lancaster Project! As you can see from the gaudy graphic at the top, we will be broadcasting the tonight’s scarf bombing live on Periscope (downloadable for iOS and Android). Just follow the details, but we will have the night’s events available on Katch, too, through the same user. We will be scarf bombing Reservoir Park in Lancaster, PA. It’s actually be pretty cold here in PA during the past few days, and we’re even supposed to get SNOW tomorrow. It may be April, but people still need to be warm during this crazy weather. I encourage you to hop into Periscope and see what we’re all about. LancasterOnline has a great series of articles that were published yersterday’s paper about the The Wrap Up, Lancaster scarf-bombing that happened on Monday, November 30. I unfortunately was not there, as I had a prior commitment and a back injury on top of that. Erin Negley of LPN wrote up a great set of articles that were on the front page of Wednesday’s paper. Now, as for the featured image at the top…..Angelia Reed, Wrap Up’s fearless leader any myself will be at the Lancaster East Side Market’s Holiday Arts Market promoting and raising money for The Wrap Up, Lancaster Project. People have graciously donated handmade items for us to sell. All proceeds go to the project. Plus, get some Christmas shopping done, too! First Scarf Bombing of the Season! The Wrap Up, Lancaster Project had its first scarf bombings of the season, not only in Lancaster, PA, but also in Columbia, PA. It was great! Angelia Reed broadcasted both bombings over Periscope (with a little help from me), and if you are interested in seeing exactly what goes on during a scarf bombing, watch both the Lancaster and Columbia broadcasts below on Katch. We didn’t much of a response from people passing by in Lancaster this time, but at the Columbia Presbyterian Church, Pastor Dave came out and spoke to us. He was quite pleased and excited we were there. You can hear a little bit about what he has to say about the project and the church’s outreach. The Wrap Up, Lancaster Project has its kickoff party on Sunday, September 7, 2015 at The Arch in Lancaster, PA. We had a nice time! It turned in a good time of conversation, knitting and crocheting, and noshing. I took two paper ream boxes full of scarves and and a few hats along to drop off. 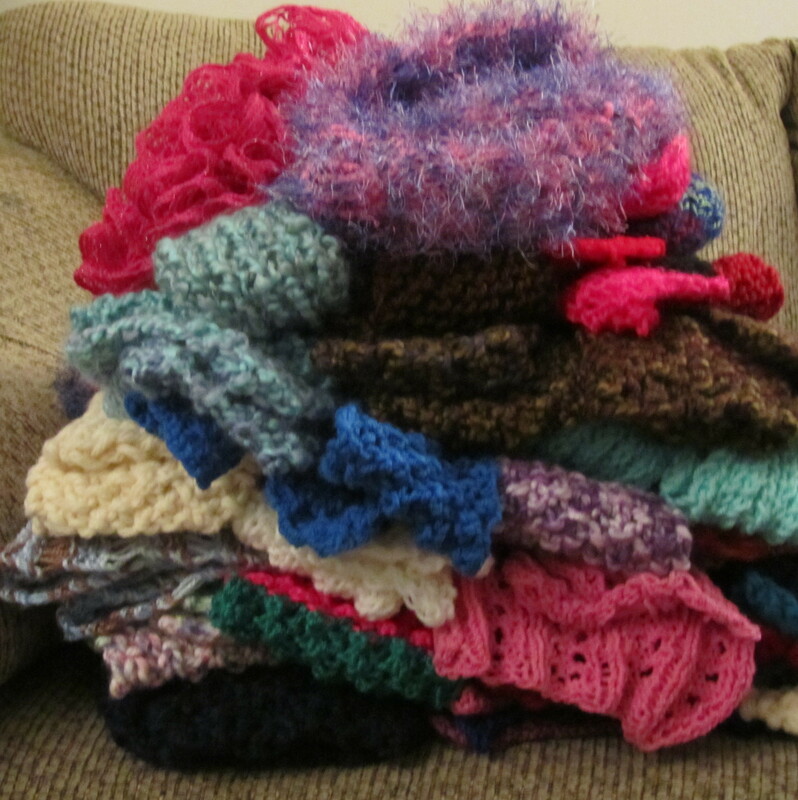 I knit a total of 41 scarves and five hats. Not bad for a summer’s worth of knitting. My co-worker Heather got me a lot of the yarn from yard sales, some of which was a TON of frogged Lion Brand Wool-Ease Thick and Quick. 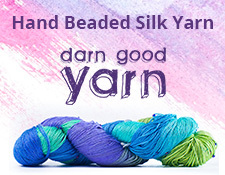 That made knitting scarves pretty fast. There’s a whole variety of patterns and yarn types in that big pile above. See, the reason why I knit so many scarves is that if I didn’t know what to knit, I knit a scarf. Since summer usually isn’t a big time to wear hand knit garments, always having something on my needles was easy since I wasn’t knitting sweaters. For more information about The Wrap Up, Lancaster Project, go to the Facebook page, and we would love if you would donate some cash over on the GoFundMe page for the project.